Sharing the same sensor as the Powershot S100, the S110 is positioned high on the scale among compact cameras with >4:3 sensors. The overall DxO Mark score of 48 places it third in this class but amazingly, just behind its predecessor the S100 which scored 50, matching the Fuji Finepix X10. Third in this large category is a very good result and the Fuji is rather more expensive but being beaten by the S100 seems to be a major failure on Canon’s part. However, for a camera with a sensor 5.5 x 7.5mm the results are still impressive. The individual scores: 20.6 bits for Portrait and 11.2 Evs for Landscape are both at the level at which DXO Mark would describe them as good for such a sensor, but the Sport score of ISO 168 is less impressive and in view of the increase in the specified maximum ISO, is disappointing. The signal to noise ratio for the Powershot S110 compared with the S100 shows virtually no difference. Among its competitors in the compact category the Powershot S110 scores well, but considering that its predecessor the Powershot S100 scores better, at a lower price there seems to be little to justify this new model beyond a desire to be seen to be bringing out new product. The new 3” touch screen, replacing a 3” non-touch screen makes navigation of the controls tidier, and for some this will justify the new model, as will the 1 stop increase in the maximum ISO. The hike in the speed is only reflected in the interface however, with barely any actual gain in low light performance. On the converse, the facility to shoot high frame rate video for ‘super slow motion’ playback has been removed from the new model, something that might disappoint some users. The S100 also had a GPS device built-in, again, this is removed on the new model. The two Canons do not stand up very well against the competition from the Sony Cybershot DSC-RX100. The additional cost of the Sony Cyber-shot DSC-RX100 is more than justified in this comparison. Since the Sony is virtually the same size, just a little deeper front to back and weighs, 213g against 198g, the Canon S110 is clearly eclipsed alongside this very capable adversary. If you are looking for a really compact camera that will produce very good results when the conditions are fair: the Canon Powershot S110 is very well worth including on your shortlist. 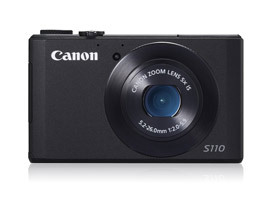 However, if you are able to find a Canon Powershot S100 then in relative terms you will have got a bargain. For those who are looking for a more versatile piece of equipment the Sony Cyber-shot DSC-RX100 with significantly better low light performance is the more professional tool, with a larger sensor it more than justifies the extra cost.